.item: The number chosen on the list, starting from 0. .text: The text which appears for the chosen item. .value: The value which is associated with the chosen item. 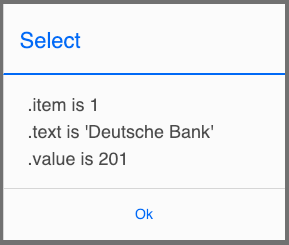 In this case, we could use the .value (201) to look up the bank by bank number. Previous PostPrevious AppStudio 7.2.0 Released!